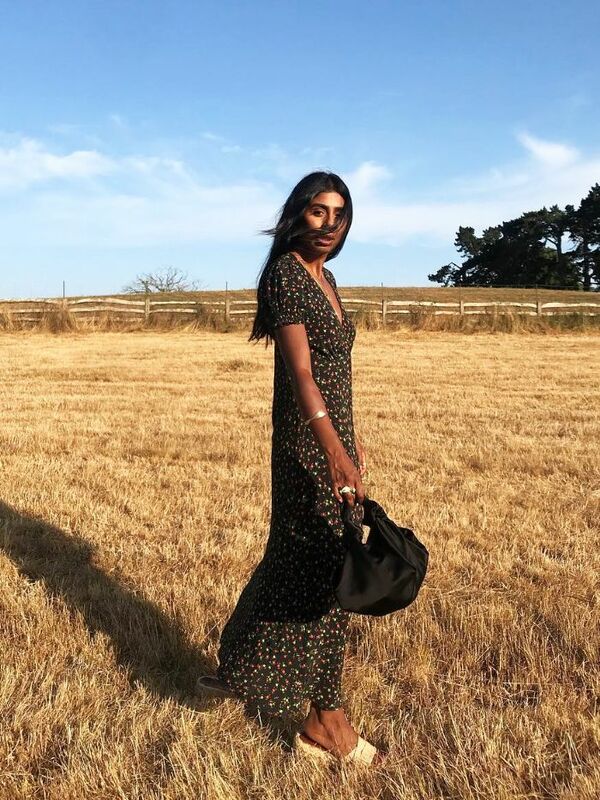 As we know, you love coming to Who What Wear UK for all manner of shopping excuses (our edits of the best basics are as tempting as the many new cult labels we uncover and share). So we thought it about time our fashion team started sharing their personal picks. We think that you’ll find a kindred spirit within our employee list—whether you’re a printed tea dress addict like our deputy editor Emma Spedding, a self-proclaimed “German grandpa” like our minimalist social media editor Isabel Mundigo-Moore (her debut selection is yet to come) or, perhaps you’re like me, and you can’t help buying shoes, mad earrings and trouser suits. If the latter sounds familiar, then you’ve come to the right place. 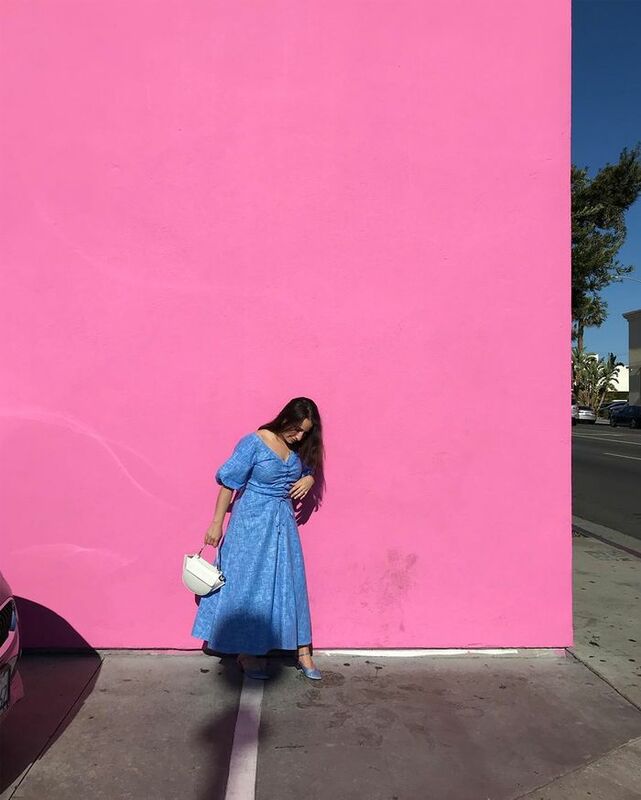 Wearing my favourite new Paper London dress on a recent trip to L.A.
Below are my current shopping picks—an edit that includes items I've actually bought as well as the pieces that are still high up on my wishlist. I hope you enjoy, and if you ever have any fashion questions you want to get to us directly (as well as desires you need to share or those changing-room meltdown stories that you'd appreciate some support on), simply join our private Facebook shopping group called So... Should I Buy This? I just had to get these once they were marked down from £355 on Moda Operandi. Polo shirts are back, and this M&S one is my favourite so far. These look so good on and they're lightweight, so I'm going to wear them to every single calendar event in my diary this summer. In case you missed this story, here is the bag I've been carrying day in and day out this year. This affordable accessory will make everything look more expensive. If you're short like me, these trousers will be more like full-length (see what I mean on my recent Insta post). I don't really "do" flats, so these are the best solution for me. I've already worn these shoes twice and only bought them a few days ago. Just a really easy summer piece to throw on. My new favourite swimwear brand, now available on my friend's (brilliant) resort wear website Beach Flamingo. I'm just sitting here waiting for this to drop and be available soon. It's a shame that it won't be available in time for my summer holiday! These were designed in collaboration with influencer Bettina Looney. They've just been restocked and I'm very keen to get a pair before they go again. This is the dress I'm wearing in the shot above, only in white. The ruched waist makes it a surprisingly versatile piece. This brand has just launched a store in London, and I was instantly drawn to the shoes because French brands are so good at creating this elegant heel shape that isn't too high but still feels high enough to be dressy. Also, gold always gets me. Head here for more advice on how to shop now.